Menulux Tablet Menu is a menu app that allows you to visually display your restaurant menus on tablets. Start using right away by downloading from Google Play Store. Thanks to Menulux cloud infrastructure, any changes made in the menu are automatically transferred to the tablets. In addition, application updates keep you up to date. 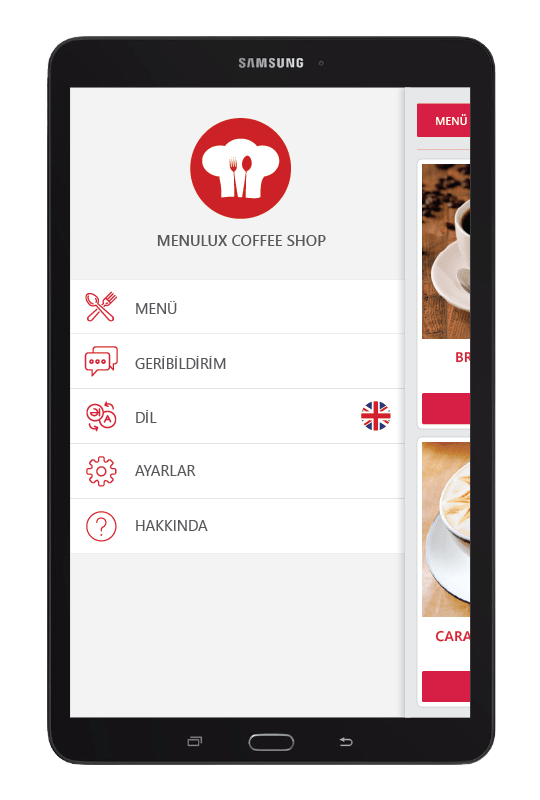 Menulux Tablet Menu is suitable for any type of business in service industry especially restaurants, cafes, bakeries and coffee shops. 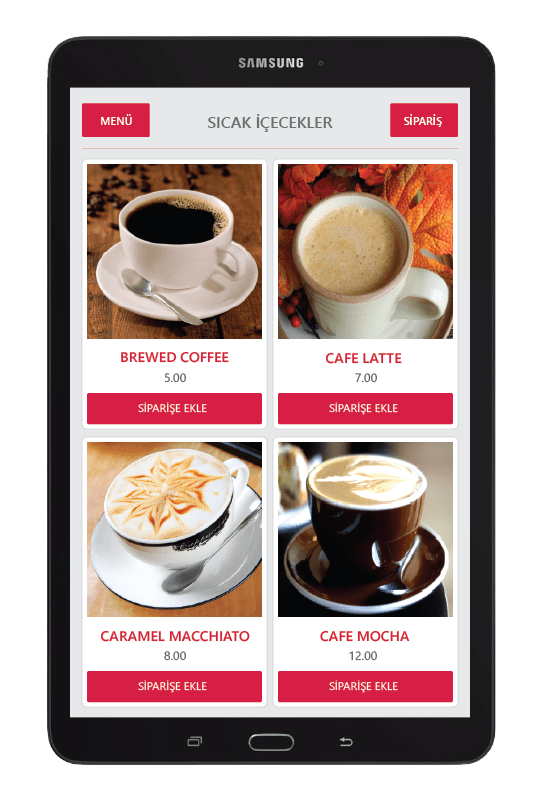 Easily enhance your visual menu and ordering experience with Menulux. Menulux offers a digital tablet menu application that allows you to create and use your menu within minutes. We provide you exclusive logos and login screens for your business, as well as well-chosen photos and descriptions of your products. 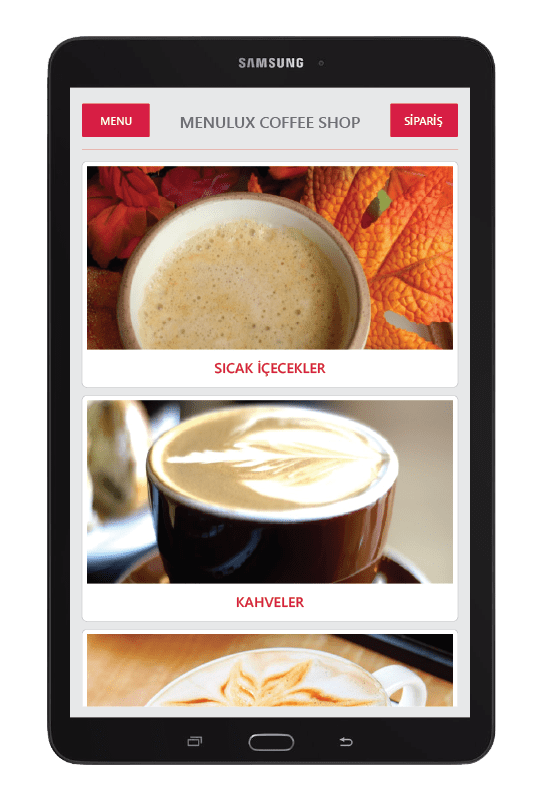 You can also prepare different menus for special day-nights and holidays, and also arrange custom menu pages for each menu. Prepare content in all the languages you want to present in your menu. Then change the menu language with one touch by tapping the language selection icon in the lower left on the menu's login screen. Modify your menus, product photos, price and description as you like. Menulux tablet menu automatically updates all your content. You can open the talented left menu by touching the MENU button in the upper left corner of the screen or by holding from the left edge of the screen and pulling it to the right. By touching the MENU button on the screen, you can list the product categories and get to the product you are looking for much faster. You can use the feedback form on the left menu to collect feedback from your customers. You can change the menu language by touching the LANGUAGE button on the left menu, similar to the language button on the home screen. Touch the SETTINGS button to change the color of your theme and make other visual adjustments. 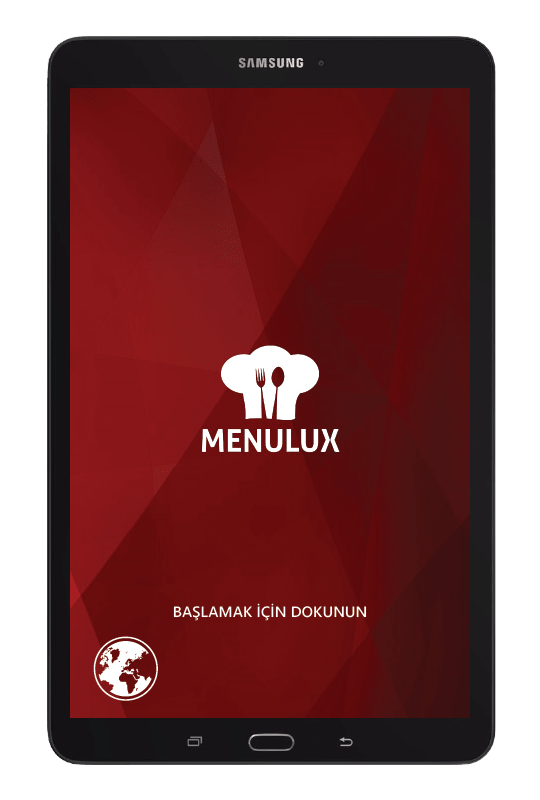 With Menulux tablet menu you can navigate between items and categories with your fingertips and you will have a fun experience. Menulux allows you to create an unlimited number of categories for grouping of products in your menu. Add a photo for each product and category and link products to categories. You can add many products to a category, or you can assign a product to more than one category. In this way, you can make some products appear under different categories. When you log into Menulux tablet menu, you will see your product categories as a list of photos. Scroll all categories by swiping the screen from top to bottom. Touch a photo from the category list to view all products linked on that category. Among the products in a category, you can scroll the screen from top to bottom with your fingertips, and you can quickly review products in the context of their photos. You can scroll the screen from left to right to navigate through the categories, or you can return to the category screen by touching the MENU button in the top left corner to make another selection. Touch the ADD button beneath the product photo to order a product. You can touch the ORDER button in the top right corner to view your order, you can open the order screen by holding the right edge of the screen and pulling it to the left. View high resolution product images, detailed descriptions and options on your screen by touching a product you like. Inform your customers the details of your products with high-quality images, explanations, price information and product options. By swiping the product screen from left to right with your fingertips, you can switch to other products in the same category and view all products without returning to the product list. Servings of your products, bitter-sweet options and so on. Inform your customers about the order details. Provide calorie of your products and preparation time information for interested customers. Share your products on social networks like Facebook and Twitter. You can promote your products to many people and acquire new customers with the social sharing that your customers make. 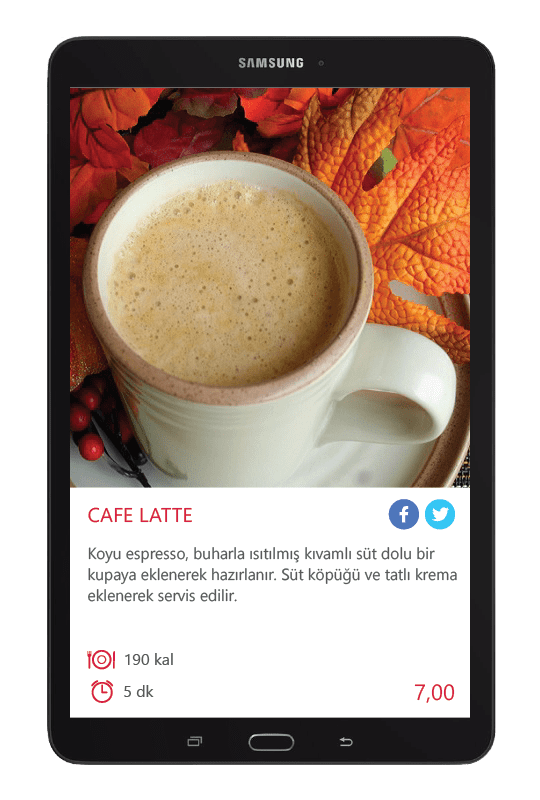 Make your customers happy by presenting your tablet menus and product menus interactively and visually. The purchase rate of products presented with visuals increases by 20-30%. Start increasing your sales with Menulux now. Thanks to sharing your products on social networks, you get free advertising and you get lots of new customers. Start trying now by downloading the Menulux tablet menu system app from the Google Play Store. At Dedeman Hotel, we are committed to provide the best quality and in our restaurant we achieve this by switching to digital tablet menus. From tablet menus we also collect feedback about our services. We are very pleased with the support and interest Menulux has shown us. We chose Menulux tablet menus to promote our products in the best possible way. We thank Menulux for its products that contribute to our brand value, and we recommend it to all other businesses. We provide fast and error-free service in our cafe with intensive customer circulation through Menulux POS system. We recommend Menulux POS system and tablet menus to all businesses.